In a medium saucepan, cook crushed tomatoes, 2 teaspoons garlic, 1 teaspoon salt, and 1/2 teaspoon pepper for 5 minutes; keep warm. Preheat oven to 350 degrees F and line a rimmed baking sheet with parchment paper. In a medium mixing bowl, combine breadcrumbs, remaining garlic, parsley, Parmesan, crushed red pepper flakes, egg, 1 teaspoon salt, and 1/2 teaspoon pepper and combine. Add ground beef until well incorporated; do not over-mix. Divide into 8 meatballs and place on baking sheet. Bake until golden brown, 10 to 15 minutes. Place piece of cheese on each meatball and return to oven until cheese melts. 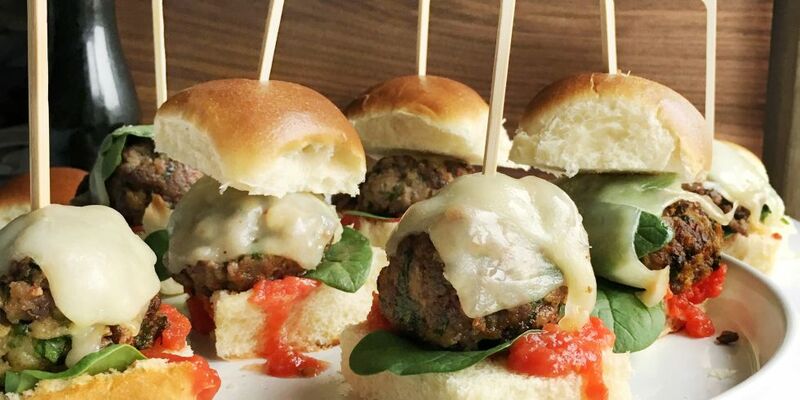 Serve meatballs on slider buns with tomato sauce, spinach, and meatballs.